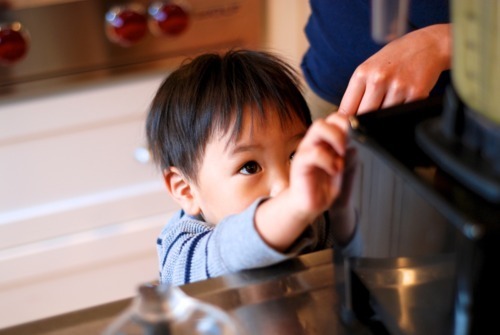 FITBOMB: Question of the Day: Do Your Kids Eat Paleo? 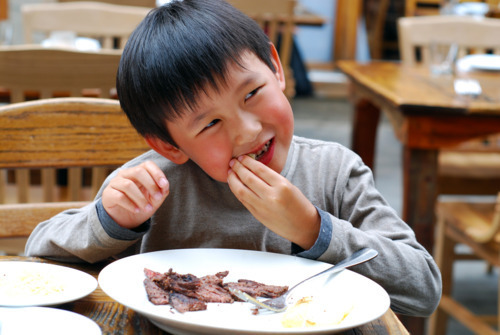 Question of the Day: Do Your Kids Eat Paleo? Believe me, we would love nothing more than to tell you that the Double-Os (ages 3 and 6) happily dig into everything we serve ‘em, that they’ve lost all interest in sugar and grains, and that their transition to Paleo has been quick and painless. But to be perfectly honest, there have been lots of bumps in the road. 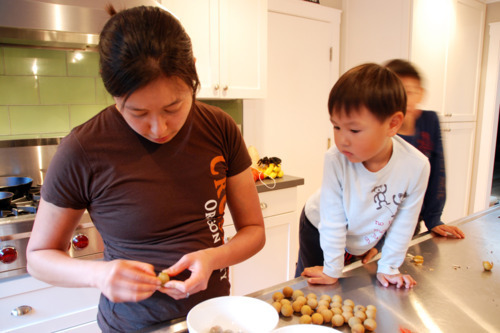 ￼For the first few years of their lives — before their mommy and daddy learned about Paleo nutrition — our kids ate like us. At the time, our diet was full of “heart-healthy whole grains,” dairy, legumes, and “natural” sweeteners (cane sugar! agave nectar! maple syrup!). Kicking these bad (but tasty) habits can be challenging for adults, but at least they can understand and appreciate the health benefits of making the transition to Paleo. Small children can’t. They just want to know why daddy won’t let ‘em have waffles for breakfast anymore. Some model Paleo parents out there have taken a Ferber-esque approach to weaning their offspring from grains, legumes, and dairy: They just go cold-turkey. For a few days, they just let their kids scream and wail in vain for their their pancakes and toast, their bean burritos and churros, their spaghetti and garlic bread, their brownies and ice cream. According to Sarah Fragoso and others, once these kids figure out that: (1) their favorite junk food items aren’t reappearing in their kitchens no matter how much they whine, (2) they’re starving, and (3) the grass-fed burger patty on their plate actually tastes pretty damned awesome, you’re good to go. Sadly, our experience wasn’t quite as smooth. We did the pantry/fridge/freezer purge. Breakfast cereals? Gone. Bagels? Gone. Cheddar bunnies and goldfish crackers? Gone. Boxes of mac & cheese? Gone. Frozen pizza and ice cream? Gone. But it’s not like the kids’ deep and abiding love for all the crap we threw out also up and disappeared with a snap of the fingers. “We just want the strawberries, then,” they’d say. Our older son handled the transition pretty well, all things considering. He didn’t complain, and hasn’t bugged us (much) about wanting grainy or sugary foods. But Big-O’s never had much of a sweet tooth, and his palate is fairly broad; this is a kid who used to wolf down Indian curries and pack down dishes of ankimo (monkfish liver) at Japanese restaurants. These days, he eats pretty much whatever we put in front of him. He tends to be especially enthusiastic about Paleo dishes that he had a hand in making — even if all he did was to stir the pot. On the rare occasions when he’s just totally grossed out by dinner, we just fry him up a sausage or a pastured, grass-fed beef hot dog (Whole Paycheck carries a few brands). Big-O is also a fan of spiced grass-fed ground beef, so M usually keeps a container of it in the fridge. Lil-O, on the other hand, is not a fan of Paleo eating. AT ALL. This, too, isn’t surprising. Not only is he exponentially more stubborn and insistent than his older brother, he’s also a carb addict of the highest order. Even pre-Paleo, we were remarking that Lil-O seemed to only eat refined carbs: pasta, rice, bread, sweets. He refused to eat meat, but we couldn’t really call him a vegetarian, either, because vegetarians eat vegetables. He was a carbotarian. The only protein he got was from dairy. 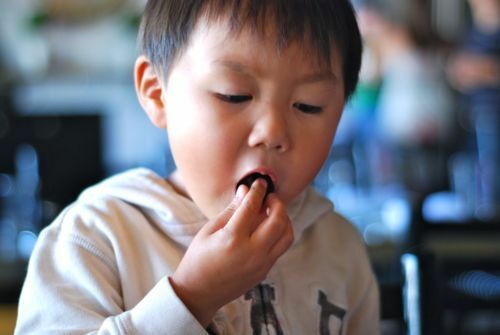 When M and I switched to Paleo eating, I tried to get our then-two-year-old tyrant to expand his palate. So one weekend, I decided to put only meat and vegetables on his plate until he was willing to try some. In response, he went on a hunger strike that lasted for days. Finally, desperate to get him to eat, I resorted to bribery. I promised him a new wooden Thomas the Tank Engine train if he’d eat a bite — just ONE BITE — of a burger patty. He burst into tears. “Kiddo,” I reasoned with him, “in this house, you have to eat some meat and vegetables.” He stared at me, and then walked to the front door, opened it, and trotted outside. “I don’t want to live here anymore!” he yelled, tears streaming down his face. I gave up on the meat and vegetable experiment. But we managed to strike up a new deal with Lil-O: If he doesn’t want to eat what everyone else is having, we’ll scramble an egg for him. (He recently — grudgingly — started eating scrambled eggs.) Lil-O still refuses to eat meat or vegetables, so we end up going through a lot of eggs these days. I keep thinking that he’ll soon be sick of eggs and demand to have some of what we’re eating, but he seems perfectly happy eating nothing but plate after plate of eggs. Still, we’re not nearly as strict as we could be about what the kids eat. The reason: We’re trying to ease them into a healthier way of eating without giving them a complex about food or making them social pariahs. So for example, we don’t strong-arm Big-O into foregoing pizza on Pizza Fridays with the rest of his kindergarten class, and he’s free to eat ice cream and cake at his friends’ birthday parties if he’s in the mood. (Believe it or not, he often skips desserts at birthday parties.) And the grandparents routinely sneak sweets to our kids whenever they visit. When we go out to eat (which is super-rare these days), we let ‘em have their beloved French fries. These are exceptions rather than the rule, but if this means we’re Paleo-blasphemers, kid-poisoners or just plain lame, well, so be it. 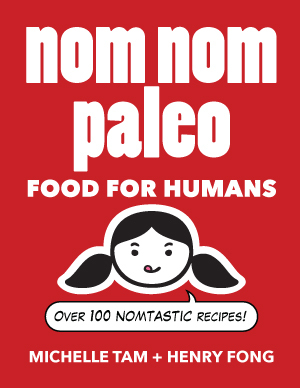 To be sustainable, we think that Paleo eating can’t be coerced. M and I try to be good role models, and we explain to our boys why we don’t think certain foods are good for them. Hopefully, they’re getting the message — but when they get older, they’ll have to be responsible for their own food choices. I’d like to think that we’ve got ‘em brainwashed already: Big-O now goes around waggling his finger and lecturing people that what they’re eating “isn’t Paleo,” and Lil-O walks around muttering “nom nom paleo, nom nom paleo” to himself when he isn’t pretending to be Scooby-Doo.